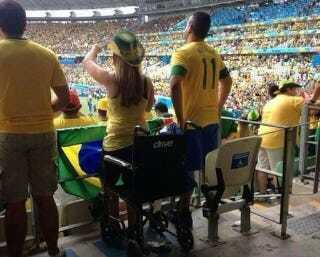 According to the Telegraph, Brazilian police are investigating images of supposedly wheelchair-bound fans leaping to their feet during the World Cup's opening match in São Paulo. The fans' possible defense is that soccer can be really, really exciting, perhaps miraculously so. After all, these older photos show that the sport has been healing the lame for a while.